Words that are written the same way, but that are pronounced differently: I live in Las Vegas. vs. This presentation broadcasts live from Las Vegas. Text normalization. Disambiguating abbreviations, acronyms, and units: St., which can be expanded as street or saint. Converting text to phonemes in languages with complex mapping, such as, in English, tough, through, though. In this example, similar parts of different words can be pronounced differently depending on the word and context. Foreign words (déjà vu), proper names (François Hollande), slang (ASAP, LOL), etc. Amazon Polly provides speech synthesis functionality that overcomes those challenges, allowing you to focus on building applications that use text-to-speech instead of addressing interpretation challenges. Amazon Polly turns text into lifelike speech. It lets you create applications that talk naturally, enabling you to build entirely new categories of speech-enabled products. Amazon Polly is an Amazon AI service that uses advanced deep learning technologies to synthesize speech that sounds like a human voice. It currently includes 47 lifelike voices in 24 languages, so you can select the ideal voice and build speech-enabled applications that work in many different countries. In addition, Amazon Polly delivers the consistently fast response times required to support real-time, interactive dialog. You can cache and save Polly’s audio files for offline replay or redistribution. (In other words, what you convert and save is yours. There are no additional text-to-speech charges for using the speech.) And Polly is easy to use. You simply send the text you want to convert into speech to the Amazon Polly API. Amazon Polly immediately returns the audio stream to your application so that your application can play it directly or store it in a standard audio file format such as an MP3. In this blog post, we create a basic, serverless application that uses Amazon Polly to convert text to speech. The application has a simple user interface that accepts text in many different languages and then converts it to audio files which you can play from a web browser. We’ll use blog posts, but you can use any type of text. For example, you can use the application to read recipes while you are preparing a meal, or news articles or books while you’re driving or riding a bike. The following diagram shows the application architecture. It uses a serverless approach, which means that we don’t need to work with servers – no provisioning, no patching, no scaling. The Cloud automatically takes care of this, allowing us to focus on our application. The application provides two methods – one for sending information about a new post, which should be converted into an MP3 file, and one for retrieving information about the post (including a link to the MP3 file stored in an S3 bucket). Both methods are exposed as RESTful web services through Amazon API Gateway. Let’s look at how the interaction works in the application. The information is received by the RESTful web service exposed by Amazon API Gateway. In our scenario, this web service is invoked by a static webpage hosted on Amazon Simple Storage Service (Amazon S3). Amazon API Gateway sets off a dedicated Lambda function, “New Post,” which is responsible for initializing the process of generating MP3 files. The Lambda function inserts information about the post into a DynamoDB table, where information about all posts is stored. To run the whole process asynchronously, we use Amazon SNS to decouple the process of receiving information about new posts and starting their conversion. Another Lambda function, “Convert to Speech,” is subscribed to our SNS topic whenever a new message appears (which means that a new post should be converted into an audio file). This is the trigger. The “Convert to Speech” Lambda function uses Amazon Polly to convert the text into an audio file in the specified language (the same as the language of the text). The new MP3 file is saved in a dedicated S3 bucket. Information about the post is updated in the DynamoDB table. Then, the reference (URL) to the S3 bucket is saved with the previously stored data. The RESTful web service is deployed using Amazon API Gateway. Amazon API Gateway exposes the method for retrieving information about posts. These methods contain the text of the post and the link to the S3 bucket where the MP3 file is stored. In our scenario, this web service is invoked by a static webpage hosted on Amazon S3. Amazon API Gateway invokes the “Get Post” Lambda function, which deploys the logic for retrieving the post data. The “Get Post” Lambda function retrieves information about the post (including the reference to Amazon S3) from the DynamoDB table. If you will want to replicate the following steps yourself, please be sure to choose a region where Amazon Polly service is available. We store information about posts, including the text and URL for the MP3 file, on DynamoDB. From the DynamoDB console we create a single table, which we call “posts.” Our primary key (id) is a string, which the “New Post” Lambda function creates when new records (posts) are inserted into a database. We won’t define the whole structure of the table now, but let’s see how it will look with some records. We also need to create an S3 bucket to store all audio files created by the application. To do this, you need to go to the S3 console where you will find an option to create a new bucket. You can choose any name for the bucket as long as it’s globally unique. Because we will want to make our audio files in S3 public, we will also need to configure our new S3 bucket and allow this kind of operation. In S3 console, check your new created bucket and click on “Edit public access settings”. In the new popup window just click ‘Save’ and confirm the action. As you probably noticed in our architecture diagram, we have split the logic of converting a post (text) into an audio file into two Lambda functions. We did this for a couple of reasons. 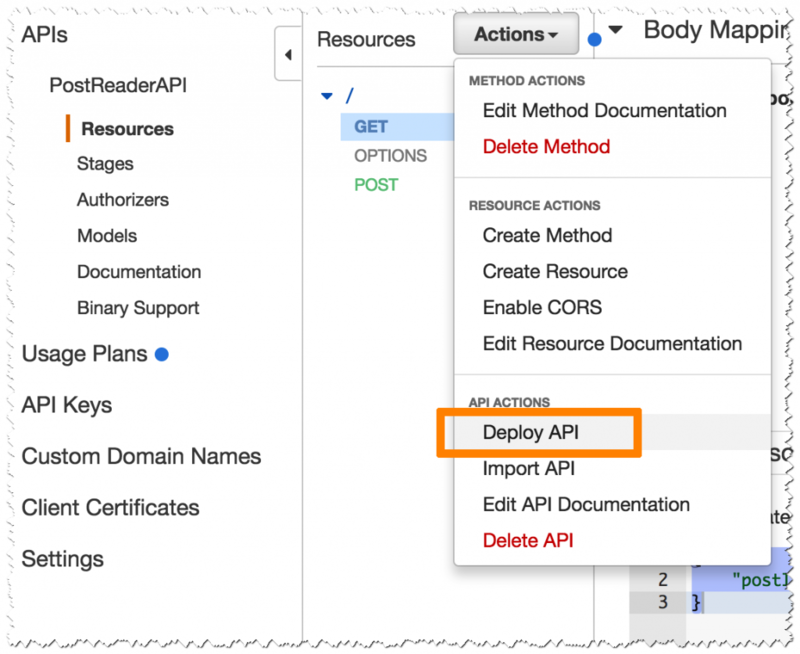 First, it allows our application to use asynchronous calls so that the user who sends a new post to the application receives the ID of the new DynamoDB item; so it knows what to ask for later; and to eliminate waiting for the conversion to finish. With small posts, the process of converting to audio files can take milliseconds, but with bigger posts (100,000 words or more), converting the text can take a bit longer. In other use cases, when we want to do real-time streaming, size isn’t a problem, because Amazon Polly starts to stream speech back as soon as the first bytes are available. The second reason is that we use a Lambda function, which allows a single execution to run as long as 5 minutes. This should be more than enough time to convert our posts. In the future we might want to convert something bigger. In that case, we might want to use AWS Batch instead of Lambda. Decoupling these two parts of the application makes this change much easier. When we have two components (in our case two Lambda functions) we need to integrate them. In other words, the second one needs to know when to start. You could do this in many different ways. In our case, we will use Amazon SNS. It sends the message about the new post from the first function to the second one. So let’s create a simple SNS topic. We can do it from the SNS console, where you will find a button for creating a new topic. Let’s call it new_posts. Before we dive into creating Lambda functions, we need to create an IAM role for the functions. The role specifies which AWS services (APIs) the functions can interact with. We will create one role for all three functions. In the IAM console find Roles tab and then press Create New Role button to open a wizard for creating a new role. Let’s name the role LambdaPostsReaderRole. In the second step of the wizard you will need to assign new role to AWS Lambda service. Don’t configure any other parameters in the wizard and just create it. After the role is created, on the Permissions tab, choose Inline Policies and then click on click here button – this will allow us to specify permissions for our new role. The first Lambda function that we create is the entry point for our application. It receives information about new posts that should be converted into audio files. In the Lambda console you will see a button for creating a new Lambda function. Let’s call it PostReader_NewPost. For Runtime, we choose Python 2.7. For now, we don’t configure any triggers. You will find Environment variables section just below your code. Still in this same wizard, we assign the IAM role that we created for the Lambda functions. The “New Post” Lambda function should return an ID, and a new record should appear in the DynamoDB table. In the first step of the wizard, we specify the SNS topic that we created. This time, we configure and enable a trigger. Whenever our SNS topic receives a new message, it executes this function. Let’s call our new function PostReader_ConvertToAudio. As before, we use Python 2.7 for Runtime. The following code is mostly self explanatory, but let’s dive into the part that invokes Amazon Polly. The synthesize_speech method receives the text that should be converted and the voice that should be used. In return, it provides the audio stream. The catch is that there is a size limit of 1,500 characters on the text that can be provided as input. Because our posts can be big, we need to divide them into blocks of about 1,000 characters, depending where the final word in the block ends. After converting the blocks into an audio stream, we join them together again. # post into blocks of approximately 1,000 characters. # will be combined into a single file. Because the posts that we want to convert can be quite big, we extend the maximum length of a single code execution to 5 minutes. And that’s all. If you retest the “Get Post” function, you should notice that the “Convert to Audio” function also executes (thanks to the SNS integration). This time, a new MP3 file is placed in the S3 bucket. The third Lambda function provides a method for retrieving information about posts from our database. From the Lambda console we will create a new function. We’ll call this function PostReader_GetPost. As before, we will use Python 2.7 as the runtime, but we won’t specify any triggers. Again, we provide the name of the DynamoDB table as the environment variable for our function. Still in this same wizard, we assign the LambdaPostsReaderRole IAM role to the function. The last thing we need to do is expose our application logic as a RESTful web service so it can be invoked easily using a standard HTTP protocol. To do this, we use Amazon API Gateway. From API Gateway console, we choose Create API option. Let’s call the API PostReaderAPI. After our API is created, we create two HTTP methods (from Actions button and then Create Method). The POST method invokes the PostReader_NewPost Lambda function. For the GET method, our API invokes the PostReader_GetPost Lambda function. The last method is CORS (cross-origin resource sharing). This method enables invoking the API from a website with a different hostname. Now, configure the GET method for a query parameter, postId, which provides information about the id of the post that should be returned. To do this, click on GET method, modify the configuration of the Method Request, and add information about the new URL query string parameter (the second screen shot below). Just provide the name of the parameter, in our case postId. The Lambda function (PostReader_GetPost) expects to receive the input data in JSON format, so we need to configure our API to map our parameter into this format. To do this, we add mapping to the Integration Request configuration. Our API is ready. After deploying it (in the popup window you can call this stage dev) we get a URL, which we can use to interact with our application. You can download the package from this link: https://s3.amazonaws.com/aws-bigdata-blog/artifacts/ai-text-to-speech/text-to-speech-demo.zip. We need to modify the script’s.js file by providing the URL for the API that we created using Amazon API Gateway in the first line. After making this small modification, we can deploy our website on Amazon S3. Let’s create a new S3 bucket (from S3 console) and put all three files in it. In the properties for the bucket, chose Static Website Hosting, enable website hosting, and provide the name of the index file (index.html). The last step is to change the bucket’s permissions so that our website is accessible by everybody. On the Permissions tab, edit the bucket policy by adding the following policy. Provide the name of the bucket in 12th line. If you write something in the text area and choose Say It, the event is sent to your application. Depending on the size of the text you provide, it can take a couple of seconds or a couple of minutes to convert it to an audio file. To see all of the posts that you’ve provided, type the post ID or * in the Search box. In this post, we created an application that can convert text into speech in dozens of languages and speak that text in even more voices. Although we created the application to convert blog posts into speech, we can use it for many other purposes, such as converting text on websites or adding speech functionality in web applications. And we did it completely serverless. There are no servers to maintain or patch, etc. By default, our application is highly available because AWS Lambda, Amazon API Gateway, Amazon S3, and Amazon DynamoDB use multiple Available Zones. So now what? Use this approach to imagine and build new applications that provide a much better user experience than previously possible. Tomasz Stachlewski is a Solutions Architect at AWS, where he helps companies of all sizes (from startups to enterprises) in their Cloud journey. He is a big believer in innovative technology such as serverless architecture, which allows companies to accelerate their digital transformation.